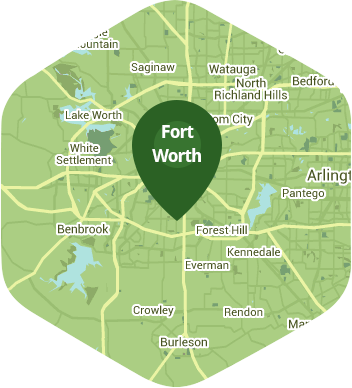 Book a skilled lawn pro in Burleson. Backed by a total satisfaction guarantee and amazing customer support. Everything is bigger in Texas – and that probably includes your lawn. No one wants to spend their precious leisure time tending to their lawn – that's less than leisurely! Leisure time in Burleson should be spent with your significant other at the winery and with your family at the Zoo or at Pirate Cove. But, if you want your lawn to look as well manicured as the green at the Southern Oaks Golf Club what's a Texan as busy as a hound in flea season to do? Well, start by calling Lawn Love. Lawn Love is a full-service lawn care company that can do it all. We offer lawn mowing and gardening services, weed control, seeding and even lawn repair if those big Texas storms do some damage. Our fully bonded and insured lawn care technicians will keep your lawn the envy of your neighbors while finally letting you kick up your cowboy boots and enjoy a sweet tea on the back porch. Call Lawn Love for a free, fast and easy two-minute quote at 817-345-6362 today. We can get started showing your lawn the love it needs, you can hang your hat on it. Rated 4.72 / 5 stars in 4,119 Burleson customer reviews. There won't be any rain in Burleson today, which means you'll probably have to water your lawn. Dusk and dawn are the best times to water your lawn (the sun will rise at 6:50 AM and set at 8:05 PM today in Burleson). Here are some average lawn care prices for homes in Burleson. Average lawn size 4,101 sq. ft.